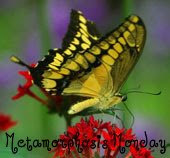 Welcome to Metamorphosis Monday brought to you by our hostess with the mostest, Susan at Between Naps on the Porch! Be sure to visit her blog to see changes she has made in her beautiful home and to see the list of this week's participants! I was wandering through Big Lots the other day, when I spied these white-washed rattan chargers...gorgeous! Let's check the price...woah!! Excuse me! I thought we were in Big Lots! Can you read it?? It says $3o...that's for one!! I remembered that my friend Linda at Nina's Nest had told me about the rattan chargers at Walmart so I hurried right over. Hey, they look exactly the same...only difference is that they are not white-washed! And...a huge difference...they are only $3.86 each!! Much Better!! And look...there are even square ones at the same price! So four of the round ones jumped right into my cart before I could stop them!! Once I started working, I realized that I couldn't stop for pictures. It was soaking into the rattan quickly and I was having to white-wash at lightning speed to keep it even. Here is the end result! I am pretty pleased with them! I made them a shade whiter than the ones at Big Lots because I think I like that better...more white and less gray looking. I think I will get a lot of use from these! Here's one on my breakfast room table holding my "chocolate" Easter bunnies and a vase of tulips. Thanks for dropping by to see my little metamorphosis! Be sure to swing by Susan's to see more before and after projects! What? No way Big Lot? You did a wonderful job! They look better than the ones at Big Lots! I love the bunnies. They look beautiful with your blue dishes! I LOVE them, Debbie!! Great thinking! I like those so much for spring that I might have to white wash some of them myself. I always enjoy your blog so much. Thanks! Wow, I can't believe that price at Big Lots! Yikes. So glad you found what you needed at Walmart. I love what you did with them, the white is fantastic. Hi Debbie! Oh, can you believe that Big Lots! That's way too much. I like yours more and by you painting them, they look awesome. Debbie - Isn't it grand when a plan comes together and WORKS!!! You did a fantastic job at accomplishing what you wanted..you've given me a few ideas! Debbie,they look great.I am going to see if they have them in my walmart or something similar,just love the white washing idea.I loved seeing your easter touches too,makes me feel like searching for some easter decor for my place. Guess what I added to my Walmart list! Yep! Great idea! Wal-Mart here I come. Love these. Thanks for sharing. I agree that I like yours more than the Big Lots version. No Big Lots near me, but we do have Walmart!! I have to steal your idea because those are just gorgeous. Thanks for sharing it! Debbie, you are so creative. I never would have thought to do that. This is the reason I read all these great blogs about decorating! You are an inspiration! I especially like the Easter bunnies on the white-washed charger. I love those, they look great with your plates! I can't believe the price of the Big Lot's ones but you found a reasonable solution and I think yours really look better -- and you got all 4 for just a little more than one! Great job -- and the Spode looks great against the white! I haven't seen those at my WM, but I will be going there tomorrow to look for them. Thanks for sharing a great idea! Wow what a great and inexpensive alternative to those pricey ones! Thank you for sharing! Debbie, I cannot believe some of the prices I have seen at Big Lots lately. I even had to ask one of the workers if I was reading the prices correctly. You did a wonderful job with the whitewash. Your chargers look even better than the Big Lot version. You are going to get a lot of use from those beauties. These are great,Debbie. I think I need to make a trip to Wallyworld! I LOVE a resourceful girl!! They look great with the blue and white china. You should take Lauries's advice about the parking lot! What is up with Big Lots anymore? Do they think they are Nordstrom's or something? Everything is priced ridiculously high there. But, now WallyWorld is right up my alley for bargains, too. I love what you did with those chargers. I am thinking I'm going to have to get some for myself. I like the square ones alot, too. Did you know you can buy spray paint at WalMart for $1 can? I get it there all the time to change out the look of other wise buys I make. I got some ugly green flower pots at Michael's for $1 each and sprayed them white. They look like a million bucks! oops... my typing fingers did a little walking on that last sentence... but you get the idea! Love the idea of painting them white. I like the white better too. Your blue and white plates look so pretty on the white rattan. Good job. I love Big Lots for their bargains BUT $30 for those chargers and they had the gall to put them on sale at $21??? Have they lost their minds - those are department store prices! But it looks like you came out way ahead. By the way, love those chocolate bunnies! Guess where I am headed today.....WALMART! Your chargers turned out great! Have a great day! Debbie, you are a genius. A genius I say! I'm off to Walmart now! Great job, Debbie. That was a smart move, they look great. Very cute! It's amazing what a little paint can do! Debbie: These look great! I am going to Big Lots at lunch! Your layout is soooo pretty. I love the colors. Debbie, what fun! I agree that your chargers look better than the chargers from Big Lots. I have never been to a Big Lots and am not sure if there is one close to me. After reading about Gollum's finds there I have been wanting to go. But now I think I will just stick to WalMart. Guess what is on my WalMart shopping list now? Way to go, love this money saver! I never shop Big Lots, having tried it once and found nothing but junk. They must have gotten very uptown! I like your solution very much, and it certainly makes more sense. Very pretty with the Spode. Hey girl I must have been at Walmart the same time you were because things were jumping in my cart too! Love those chargers! They look awesome! WOW! Great job! I love how the whitewashed charger loks with the blue spode. So these painted up well? I have been wanting to do this, but have not wanted to be the first. I have not been able to find chargers the color I want, but thought if I buy these and spray paint the color I want.... sky the limit to as much storage space that I have. :D Thanks for sharing! How very clever of you ... they look lovely! Now, go back and purchase the square chargers and do something else spectacular! Debbie, you are so funny. I laughed so hard when you said 'rattling around in my brain from watching hours' of HGTV. I know exactly what you mean :) Thanks for sharing with us, looks like the race is on to Wal-Marts across North America. I will definitely be checking out some Canadian Wal-Marts and hoping they have them too! I love those chargers especially with the Blue and White. I will definitely use that! I enjoyed reading the post in French...it has been a long time, but I think I understood. I was just in Quebec and I was surprised at how their French differed, as well as, their accents. I met someone from Paris and his accent was in stark contrast. I cannot remember if you are a Francophile and a plate addict, but I thought you would find it interesting. I read another post you did..I think it was a print you got at Big Lots and I thought I need to go there. I had no idea they had such high end things. Although the $21 chargers wouldn't have found their way into my basket either. I am impressed and inspired to go to Walmart and copycat your idea! Thrifty, crafty and they look amazing! KUDOS! Lovely! You did a great job! These redo's are so much fun to see! There you go girl............I know we were in big lots a few wks ago and right up by the front door they had a large ben full of throw pillows on SALE.$25.00.I said what?? ?The clerk even greed with me.This is Big LOts,not Neimans.Sheesh???????? ?I could not believe it. That was brilliant and the results of your creativity is beautiful! Big Lots this time became A Whole Lot! These are lovely. You did good. Nice work, Debbie! They look beautiful. What is up with Big Lots these days anyway? Prices are going out of site. As for the cheddar biscuits, I haven't been to a Red Lobster in years, so I don't remember the biscuits. But these are goooood! Girl, aren't you the creative one!!! I just love your white-washed rattan chargers!!! I hope you don't mind but I think I'm going to be a copy-cat...I've always liked the rattan but really didn't want the natural color...white-washing them would be perfect! Thanks for the idea!!! Okay...what's up with Big Lots? $30 for a rattan charger??? Eeeekkks!!! I've seen pieces of furniture in Big Lots cheaper than that...hehe!!! Have a terrific day, my friend! Sending much love your way. I think I am going to try and do some yard work today. Finally got a little sleep. I'm sure the staff in your home appreciates how ingenious you are. Cash saved is cash earned for kitty treats! LOL You did a fantastic job, and I grinned like crazy when I read that you went back and bought them again. Who knows what color you'll end up doing next! I'm thinking I could use black. :-)Well, I'm sold, heading to walmart right after I hit the send button.